Just like the gamma match for our 4 Elements Yagi the construction technique for building the gamma match for the 5 Elements UHF Yagi are similar, except for major changes on measurements. The gamma tube for the 5 Elements UHF Yagi is exactly 4.5 cm. Please refer to the diagram for actual measurements. 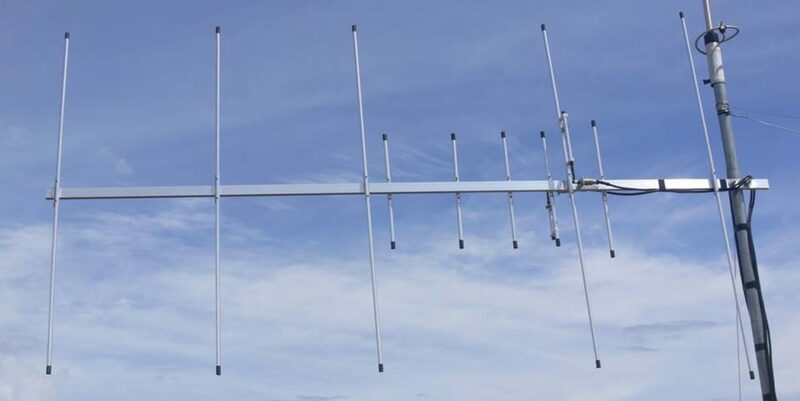 This yagi will give you a good coverage from 430Mhz to 450Mhz on single configuration @ 1:1 SWR on center frequency 435Mhz and about 2:1 SWR on band edges. So what is a gamma match in the context of the driven element and why should we use it?. A gamma match is an adjustable device used for feeding and matching an antenna, coupled to the driven element of a beam to match the 50 ohm coaxial feed-line. 1. Usually it’s a small diameter wire parallel and in close vicinity with the main radiating element, it will carry only a fraction of the main element current while being exposed to the same electrical field strength. This turns it in an effective up-transformer of the antenna input impedance. A sort of folded dipole performing an impedance step up. 2. It forms together with the main radiating element a closed wire stub, adding inductance to the antenna input impedance. If it is not required for matching, this additional inductance can be cancelled out with a lumped capacitor in series. A parallel shorted transmission line stub, adding shunt inductance. 3. The sheath of the coaxial feed-line (braid) is connected to the center of the main radiating element. When properly connected, a gamma-match also serves as a balanced to unbalanced converter or balun. A note of caution: This gamma match would work only on the specified antenna design. Since this is a matching assembly you need to adjust it to your specific design if you happen to re-purpose it for other antenna project. Probably it’s one of the reason why most of the available design on the internet provides only the elements measurements (antenna matching is a subject for experimentation). 8. Collapsible tube (shrinkable tubes) for securing the ends of gamma match assembly. To build the gamma match, cut the required materials as seen on the diagram. Insert the round plastic spacer to the middle of solid wire and put a rubber stopper at both ends of the gamma tube. You need to cut a hole in the middle of the bottom rubber stopper to facilitate inserting the wire to the gamma tube. Bend the wire to the actual measurement in the diagram and solder the SO239 connector to the wire. Secure the gamma match assembly using the shrinkable tube to make it water tight. Put the plastic spacer in between the driven element and the gamma match and secure it with the cable tie (Optional for this build). Finally attach the gamma match to driven element and and sandwich the shorting stub with 2pcs aluminum plates and secure it with the butterfly nut. Use the shorting stub to tune your antenna.